Did you know? Attracting new guests will cost your hotel 5 times more than keeping an existing one. Research reveals that cost of keeping an existing guest is 10% of the cost of acquiring a new one. (Source: marketingdonot). Leave your mark: Ensure that you and your staff leave a lasting impression on the guests who are staying in your hotel. – Set high standards for your staff and let them know that service cannot be compromised. You can also incentivize your staff based on the level and commitment to excellent service. – Show gratitude when your guests feel happy or special, and apologize when you have not been able to deliver a promised service. It pays to take all guest feedback in a positive way as the guest will feel that you care about the way they feel. – Lend a helping hand whenever required. Small gestures like a staff member assisting an elderly guest climb the staircase or pro-actively offering a high chair for a family with a toddler can go a long way in earning the guest’s trust. – When your guest is departing, gift something – it could be anything like a box of chocolates, a bookmark, a local souvenir or a hamper of toiletries. This may not really require too much investment but might just encourage the guest to write a positive review. You can further customize the gift items by printing your social media handles and your TripAdvisor page link to request them for reviews. Keep in touch: Your guests should never feel that ‘if they are out of sight, they are out of mind’. Send them an email after a few days or weeks of check-out to show that you remember them and for them to keep your hotel’s memory afresh. You could also send them emails on days when you have discounts or special packages running. Regard loyalty: For the guests who remain loyal to your hotel, delight them with exclusive packages to make them feel special. Alternatively, you could give them a percentage of discount on their next stay. Never forget to reward their loyalty. Know your guest in and out: Know your guests’ requirements like things that encourage them to return, their interests, favorite season, favorite view from the room, eating habits and preferred timings. Once you know their requirements, it becomes easy to plan targeted marketing campaigns around them. Also, don’t be adamant about your hotel’s policies. If your guest prefers breakfast at 6 am or 11 am, adjust with their timings. Such flexibility on your part can make their stay most comfortable and take you a long way. Which reminds me of an incident where my husband and I had to check-out from a small guest house early at 6 am. We checked with the hotel manager if it was possible to pack some breakfast for us to have on the way. The manager not only agreed readily but ensured that the staff woke up early to have the farm-fresh sandwiches ready well before time. What was even nicer was that when we opened the sandwich boxes on the way, we were pleased to see they had packed more sandwiches than we had asked for with a small letter of ‘Thanks – Hope you like the sandwiches and reach home safely’ left inside the box. It ended our stay on a really sweet note and we felt obliged to leave them a positive review on TripAdvisor. Give and take on the spot: If your guests have faced any shortfalls in services or amenities, be spontaneous to resolve them and ask for instant feedback which will help you improve your services. 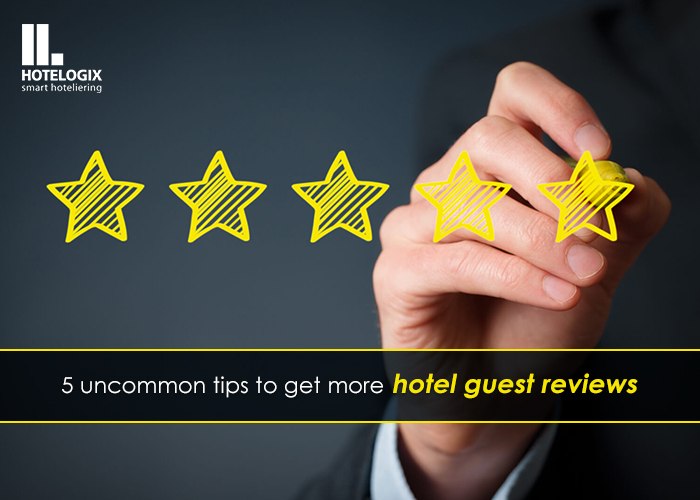 As a hotelier or staff member, one can gradually improve based on the instant feedback given by the guests. Your guests will also feel special when you ask them to rate your service or share their opinion. Make every visit count: Make sure that your guests’ third or tenth visit is as satisfying as the first one. Returning guests come with set expectations which can either be met or exceeded. Try and focus on making every visit count. Prepare your staff: Instruct your staff to remember and recognize the guests who are visiting the property more than once. A property management system with auto guest suggestions can help them get all the details of the returning guest’s prior stay, preferences as well as any feedback they may have left earlier, so that the staff can customize the service. Train your staff to offer personalized services and also on handling complaints and questions smartly. Half of your battle will be won if your staff handles and manages the guests in an effective manner. Watch your competition: It’s always good to know your competition as it will help you analyze your weak and strong points. Keep a close eye on the marketing tactics used by them to attract guests and ensure you use a powerful way to differentiate your hotel from them. This doesn’t mean dropping your prices lower than the competitor’s, but giving better service that will be valued forever. Ensure that your guests get true value for their money. Guests tend to compare hotels based on services and not prices alone so as long as you give undivided attention and flawless service, you will fare better than your competitors. Hotels should not take customer retention lightly as it can play a big role in improving a hotel’s bottom line. A 5% increase in customer retention can increase a company’s profitability by 75%, and 80% of the revenue will come from just 20% of your existing customers (Source: Bain & Co. and Gartner). "Why and how can hotels focus on retaining guests? ", 5 out of 5 based on 1 ratings.